First picture, so better put Kirby in it. and I love to use different characters, but still think Gooey's better. Yes, I know he doesn't have a hand to swing swords and hammers, but he managed to swing a parasol. There wouldn't be any problems with using swords with his tongue, right? Awesome Yo-yo hat, by the way. GOOEY YO-YOS ARE NOT FOR EATING. WHAT ARE YOU DOING. Awesome work, the jagged panels look good as a background. |3 And gooey in a hat is always something amusing to behold. 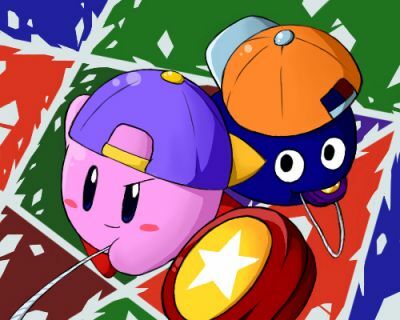 @Chibi- Pohatu: Just thought to trade the colors of the hat and yo-yo to make difference. Looks like it worked fine. @Diddgery: Well, colourful yo-yos DO look like candies. You can't blame Gooey for eating it! @Rizu: Gooey with a hat. It could have worked in SSB. And Gooey with hair... That's... a bit different problem. Wow, 3 comments for the first picture. I guess I'm getting a good start on this. This a great picture! I don't really know what else to say! I love the backround! Nice. Gooey: I'm hungr-Oh look, a Gim! Munch munch... I'm still hungr-Oh look, candy. Must be Gooey who attracts so many viewers. See HAL lab, you definetly must get him back on the series. @ShadowChao277: I tried to make a stylish-KIND-of background. I don't know if I managed to do it, but at least some seem to like it. Thanks! This is a great first picture! Sorry I've never commented before, but let me say I am very impressed with all your works. Super perspective, crisp, clean lines and colors, and just the right amount of shadow~ the entire picture really completes itself. @Dedede-Daimyo: Wow, a comment from Daimyo himself. Thanks, I guess I can be proud of my works now.